Netriplex announced today that it has expanded its workforce by 30 percent since January 1 to better support its rapidly expanding customer base. Asheville, NC (PRWEB) April 30, 2009 -- Netriplex LLC, a global datacenter provider headquartered in Asheville, NC, announced today that it has expanded its workforce by 30 percent since January 1 to better support its rapidly expanding customer base. Plainly, the current economic recession is not affecting all industries equally. Independent datacenters, in fact, are growing. In its April forecast, market research firm Forrester says that it expects IT outsourcing sales to increase by 2.1 percent in 2009 and 6.5 percent in 2010. Chief Technology Officer at Netriplex, Jonathan Hoppe, comments: "Despite a difficult economy, the unabated growth of the Internet for social networking, streaming media, software as a service and other application delivery continues to drive demand for more datacenter space and power. Rather than invest significant capital and operating costs in private data centers, businesses are increasingly outsourcing to independent datacenters like Netriplex who offer high value in both dedicated and colocation hosting." Netriplex made significant investments in its infrastructure in 2008, making it one of the most robust independent managed datacenter companies of its size. "Facility space at the Asheville datacenter was enlarged by 50 percent, power infrastructure was tripled, network capacity was enhanced to a new ceiling of 480 Gigabits-per-second, and bandwidth providers were increased to 13 and counting, Now we've expanded 30 percent in both sales and support engineering staff," explains Chief Operating Officer, John Thompson. "With that level of robustness and redundancy, Netriplex remains a value leader in our industry." Founded in 1999, Netriplex is a global provider of IT infrastructure hosting and business continuity solutions. Its new 15,000 sq. ft. SAS70 Type II certified data center in Asheville, NC, offers web hosting, grid computing, server colocation and disaster recovery office space in a state-of-the-art and completely redundant environment designed for 100% uptime. Netriplex operates other datacenters in Boston, Atlanta, Dallas, San Jose, Seattle and London, U.K.
New “Wine and Dine on the Mountain” Weekend Kicks Off the Season in Highlands, NC. Wine and Dine on the Mountain will kick off the 2009 season in Highlands, NC, by pulling together a sizzling line-up of fine wines, superb food and fine art May 1 through 3. The “Wine and Dine on the Mountain” weekend is a sensory extravaganza that begins with a Champagne Reception followed by a 5-course Shafer Wine Dinner at Wolfgang’s Restaurant and Wine Bistro Friday night at 7 pm. An Hors D’oeuvre Reception will begin Saturday evening at Madison’s Restaurant, followed by a Caymus Dinner. Guests of both events will have the opportunity to watch the wines come to life, as Arvid paints live for the occasions. On Sunday at noon, a New Orleans Jazz brunch at Wolfgang’s will take center stage. Named one of the top "25 Artists You Should Know" by US Art magazine, Thomas Arvid receives critical acclaim for his monumental compositions of wine and his mastery of light, depth and reflection. Inspired by the grace and hospitality of the southern culture in which he lives, Arvid’s compositions are an invitation to take the time to appreciate sharing a great bottle and good conversation with friends. Space is limited. To reserve today, call 866-526-8008. For more information, visit oldedwardsinn.com. Baltimore, Md. (April 17, 2009) — Exciting, reliable, budget-friendly locales captured readers’ hearts and votes as cities nationwide vied for top ranking in AmericanStyle magazine’s 12th annual Top 25 Arts Destinations poll. For the second year, Asheville, N.C., with a storied crafts legacy dating to the turn of the century, held the No. 2 spot among small cities. Santa Fe, N.M., received top honors in the category, while Sedona, Ariz., placed third. Once again, the winners’ list features a mix of traditional destinations and emerging arts scenes where galleries contribute to community revitalization. With so large a selection of arts cities to choose from, readers will be itching to hit the road. Luxury travelers will not be able to resist destinations boasting premier museums, galleries and festivals, while “staycationers” will be pleased to find great art cities within driving distance. Complete lists of all 25 winning cities in each category, plus tips for affordable travel and information about exciting arts destinations in the United States are featured on www.AmericanStyle.com and in the June issue of AmericanStyle, now on newsstands and at major booksellers across the country. To receive a preview of each new edition of AmericanStyle magazine and special bonus content, sign up for the free e-newsletter at www.AmericanStyle.com. AmericanStyle magazine is a national lifestyle magazine for art enthusiasts, collectors and travelers. Launched in 1994 by The Rosen Group, the bi-monthly publication features articles on contemporary artists, galleries, arts travel and art events. The annual Top 25 Arts Destinations readers’ poll has earned the magazine national recognition as the premier arts travel resource. Girls on the Run is a lot more than just a running program! We are a curriculum-based, life-enhancing, prevention program serving girls in the 3rd through 8th grades in Western North Carolina. We are a non-profit organization with a mission of "educating and preparing girls for a lifetime of self-respect and healthy living." Girls on the Run combines training for a 5K (3.1 miles) running event with healthy living education. Our programs instill self-esteem through health education, life skills development, mentoring relationships, and physical training - all of which are accomplished through an active collaboration with girls and their parents, schools, volunteers, staff and the community. Race like a kid to sponsor a kid! The SoQua District part of the local Daniel Boone Council of the Boy Scouts is hosting its first event Corporate Pinewood Derby competition. 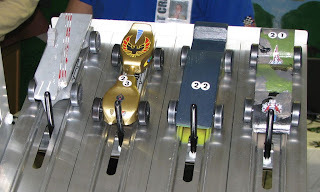 I am sure many of us remember the Pinewood Derby from scouts, you get a rectangle chunk of wood, a few wheels and several hours locked in the basement with Dad and wallah you have a race car! 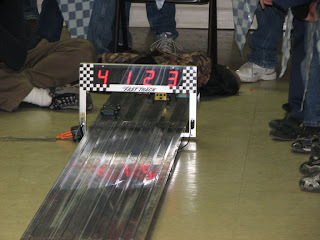 The Corporate Pinewood Derby is your chance to relive the whole thing again! 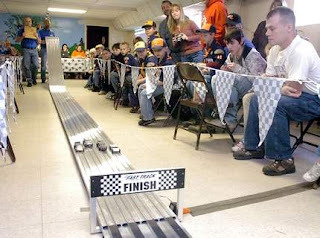 Your involvement in the Corporate Pinewood Derby will help support more than 1,500 youth in the SoQua District (Buncombe Country) to “Do Their Best”. Participating in the derby will provide resources that will help the Boy Scouts continue to shape the future of our youth with principles of honor, respect, and self-reliance that will last a lifetime. It costs the Daniel Boone Council approximately $125 per year to support each Scout in the program, so by sponsoring a car in this race, you can help shape a Scout into a future leader! Download the PDF brochure here! Another new hotel in Asheville! The Brookstone Lodge is now open! This brand new 73 room hotel located off I-40 at Exit 51 opened their doors on Friday, April 10th. This lodge style hotel is independently owned and operated and offers southern hospitality with many amenities like a complimentary deluxe continental breakfast each morning as well as an indoor pool and hot tub, fitness room, gift shop, and free high speed wireless internet throughout the hotel. They have a meeting room with outside patio available for rental for your next meeting and/or special event. 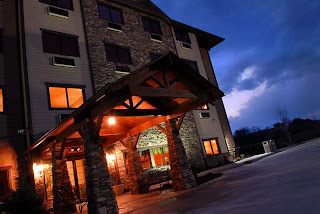 The lobby offers a floor to ceiling double-sided rock fireplace and exposed timbers that help to create a lodge atmosphere, and yet they provide you with the convenience of being minutes away from all Asheville has to offer. 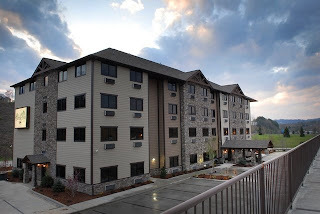 Please plan to attend their ribbon cutting celebration on May 7th at 4:30pm to get a look at Brookstone Lodge first hand. The Chamber staff has adopted Hill Street through the Quality Forward Adopt-A-Street Program. Most of the staff took a half hour to an hour out of the day to clean up the street which gathers lots of debris. We couldn't have picked a nicer day, sunny and breezy, a perfect day to get out of the office. Here is the staff in action! The Asheville Regional Airport Authority is proud to announce that it has received $7.5 million in economic recovery funds under the American Recovery and Reinvestment Act of 2009. The funding was distributed by the Federal Aviation Administration under the direction of U.S. Secretary of Transportation Ray LaHood. Allocated funds will be used to improve the terminal at Asheville Regional Airport. The project is slated for bid in May, awarding of contract in June, with construction beginning in July. Renovations are expected to be completed by Spring 2011. YWCA of Asheville 2008 Annual Report from YWCA Asheville on Vimeo. There has been a date change for the strive not to drive planning session it is now April 23! 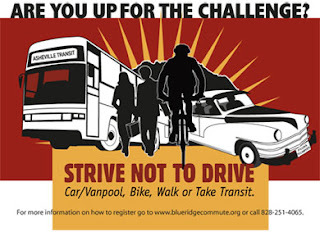 Strive Not to Drive has become an annual event that encourages people to avoid driving their car for one or more days during a specific week to experience the benefits and opportunities of walking, bicycling, riding the bus, carpooling, telecommuting, etc. This year Strive Not to Drive will be held during the week of May 11-15th; which is also National Bike to Work Week. How can you help? It’s easy. Attend the employer breakfast on Wednesday, April 23 from 8:30 – 10 a.m. at the Greenlife Grocery Community Center located off Merrimon Avenue in Asheville. Receive information on Strive Not to Drive and hear from other employers who participate in other transportation programs. 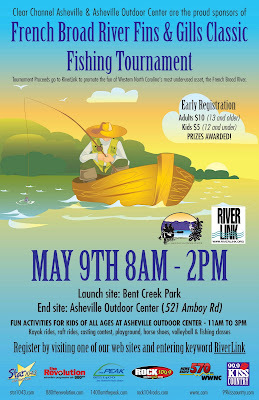 PLEASE RSVP BY FRIDAY, APRIL 17, 2009, NOON to Kathy Molin, TDM Coordinator, City of Asheville 828-232-4564. Looks like Luella's is packing up the smoker and moving to North Asheville! After just celebrating their two year anniversary in South Asheville, Luella's is making plans to move to 501 Merrimon Avenue (formerly Gusmo’s Mojo Café and Boston Pizza). Updates on the progress of construction will be posted on the Luella’s Bar-B-Que facebook page. Former Chamber Board Chairman and one of our most active members / volunteers, John Mark Stroud, has been selected to be Mountain BizWorks interim CEO. Below is the official announcement from Mountain BizWorks. The Mountain BizWorks Transition Team has been hard at work for the past two months and has completed the first phase of the executive transition process. Under the direction of Gary Landwirth and Judy Futch, project consultants, the team conducted an organizational assessment that served as the basis for the Mountain BizWork Board’s development and approval of a 12-18 month update to the organization’s strategic plan, a leadership plan for the new CEO and the CEO position profile. In reviewing the transition timeline, the Board made the decision to appoint an interim CEO to ensure continuity of leadership and a smooth transition to the new CEO. The Mountain BizWorks Board is pleased to announce that John Mark Stroud has agreed to serve as the interim CEO. John Mark is dedicated to the mission and work of Mountain BizWorks, has been a strong Board member and is an effective leader who will provide the leadership needed during the transition. John Mark will continue in his role of Chair of the Executive Transition Team. 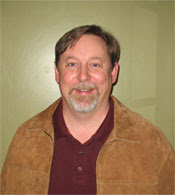 John Mark is a native of Western North Carolina, having grown up at Lake Junaluska in Haywood County. After several successful years working for Marriott Corporation in Atlanta, he returned to the mountains he loves with the intention of starting his own business. That dream was realized when he opened his FASTSIGNS in 1995. After twelve years of double-digit growth and many accolades, John Mark sold his business to focus on the commercial real estate investing that he had been doing since 2000. The Transition Team is now in the second phase of the project to advertise the position, review applications, interview top candidates and recommend the final candidate to the Board. Position announcements have been placed with microenterprise and non-profit organizations with a full position profile available on Mountain BizWorks’ website, www.mountainbizworks.org. Applicants are encouraged to email materials to search@mountainbizworks.org before May 8, 2009. The Team is committed to a comprehensive recruitment process and hopes you will assist in encouraging people you know to apply. A short version of the position announcement is included below for your review and distribution. Thank you for your continued support of Mountain BizWorks. We look forward to sharing more with you as the transition process progresses.